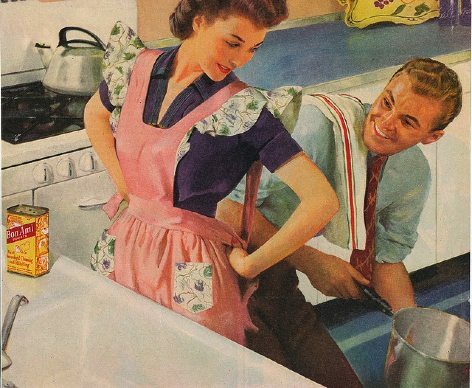 The division of roles between men and women in the Netherlands continues to evolve and more men are taking on household roles, according to research by the national statistics office CBS. At the same time, more women are becoming breadwinners, even though they still earn less than men for doing the same job, the CBS said. The CBS analysed the division of roles between men and women over the past 60 years and concludes emancipation has not stopped. ‘It is a slow development which takes place over generations,’ researcher Jan Latten told news agency ANP. In 1969, just 31% of Dutch women had a job. By 2012, that percentage had almost doubled to 61%. Three quarters of men now work, compared with 84% in 1969 and in 20% of households, women now earn more than men. In addition, ‘men are more often to be found in the kitchen than they were 30 years ago,’ Latten said. In 1975, women spent an average of 35 hours a week on housework, while men were busy in the home for just 8.5 hours. By 2011, women were working 12 hours a week less at home, while men had increased their domestic duties by almost four hours a week. Even though women are still under-represented in influential jobs in politics and industry, they are catching up. For example, 56% of all judges are now female, the research shows.